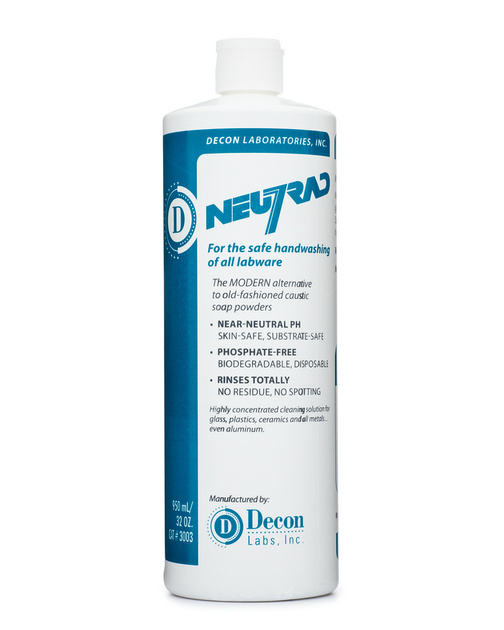 NEUTRAD® is a safe detergent for manual scrub cleaning of any labware – replaces old fashioned caustic soap powders! Highly concentrated, very economical. Near-neutral, pH is skin-safe! Phosphate-free, very rinsable and biodegradable. Liquid NEUTRAD® is instantly soluble, totally rinsable, safe, near-neutral pH and phosphate-free. Offers huge performance and safety advantages over soap powders. Cost comparisons with soap powders are simple – 1 Liter of NEUTRAD® is equal to 2 lbs. of soap powder, 5 Liters is equal to 11 lbs. of soap powder.